Monthly Lenses Multifocal Biofinity If you want to see well at all distances! The progressive lenses that allow flexible or prolonged use 29 nights / 30 days. 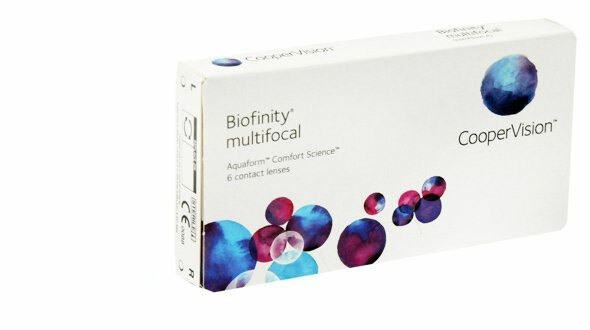 Biofinity is the new silicone hydrogel material contact lens from CooperVision. It is manufactured with the exclusive Aquaform technology. The exclusive silicone monomer allows a more efficient transmission of oxygen. The hydrophilic components and the silicone work together to achieve a natural wetting that keeps the water content throughout the lens. Balanced Progressive technology allows good vision both far and near. Its system of progression, with an asymmetric geometry for each eye, depending on whether it is the dominant eye or not (just as you have dominance with one hand in front of another, right or left handed, in the eyes it happens the same) and with concentric fields for far and close, you get great satisfaction with the vision both far and near. Presbyopia is a condition related to age. Do not worry, it happens to everyone. By the time you're 40 or 50, you may find it harder to focus on nearby objects, such as the book or print magazine, especially in low light. Without treatment, presbyopia can cause headaches and eye fatigue when the work is done. Starting around age 40, the lens of the eye becomes less flexible, making it more difficult to adjust your focus quickly from distant objects to nearby objects. And it can become harder to focus on nearby objects at all as you get older. Presbyopia shares some symptoms with a vision of the future, but they are not the same. Hyperopia is caused by an irregular eye, while presbyopia occurs when the lens of the eye becomes less flexible, even in the form of eyes without defect from afar. Presbyopia can be corrected with reading glasses, bifocals, progressive lenses or multifocal lenses such as Biofinity Multifocal. This versatile contact lens allows you to see up close and far in each eye. It can also be used in monovision, where one eye has a contact lens to see up close, while the other eye has a contact lens to see from afar. Depending on the extent of the monovision, a single contact lens may be all that is needed. 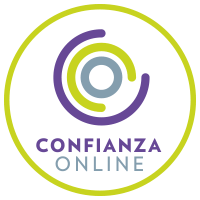 In Prodevisión you can buy Biofinity Multifocal contact lenses easily, comfortably and at very competitive prices, enjoying all the purchase and security guarantees. We are a serious company with many years of experience in the world of optics (contactologists, we adapt lenses daily in our center). We are professionals. Enjoy your cheap lenses , get rid of your glasses, in a few days you will have your contact lenses online at home, make your order from home, your work or even your mobile phone easily and without moving, we take care of everything. When buying Biofinity Multifocal lenses in Prodevisión, it is necessary that the lenses have been prescribed by an Optical Vision specialist or Ophthalmologist, from there, you must make your order by copying the parameters of the last box of progressive lenses that you have acquired, that is, the first adaptation has to be done by the professional who will assess vision, movement of the progressive lens in the eye and also teach you the correct operation and maintenance of the lens. It is important to mention the maintenance fluid, usually called a single solution. This must be of quality (first mark, all liquids are not equal) and it is always possible to use it. A change of contact lens fluid can cause serious problems in the use of contact lenses. 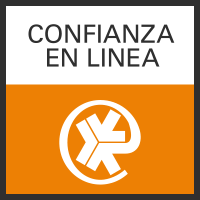 In Prodevisión we have the first and best brands of maintenance liquids on the market that assure you that they will take care of your eye and your cheap Biofinity Multifocal lenses with all the guarantees. It is essential to follow all the indications of use of the manufacturer of the monthly lenses (Coopervision) in terms of hours of use, care, handling and replacement. Regarding the replacement it is very important to respect it, given that, they are discarded a month after opening the blister in which they come from the factory (there are 30 sets, but 30 days after opening). The contact lenses online with the passage of days accumulate tear deposits, dust, environmental dirt, poor cleaning ... If the lenses are not discarded they can trigger an ocular irritation and consequently an allergic reaction. If you notice discomfort when wearing them, red eyes or do not see correctly, take off your cheap lenses immediately and discard them, consult your optician or trusted ophthalmologist. Otherwise, you may have eye problems. In Prodevisión we are vision professionals, so if you have any questions or problems do not hesitate to contact us. For our part, as specialized contactologists, we will be happy to help you as much as we can.